Every child has, plays with and loves stacking blocks, but a little peace and quiet is a good thing to have too. 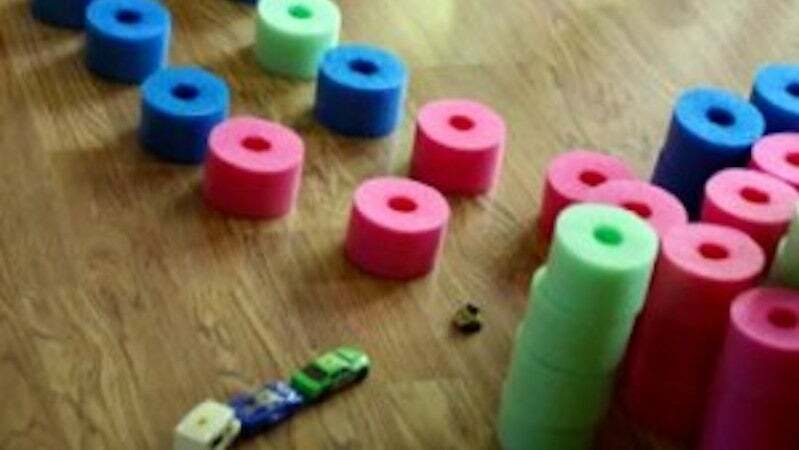 Use a pool noodle to make a set of "quiet" blocks that are just as fun to play with but a little quieter to get the best of both worlds. Image from I Can Teach My Child. You'll need a pool noodle (you can use a broken or old one if you want), a serrated knife and a ruler. Mark every 5cm along the noodle, then cut through the noodle at each mark using a mat or cutting board to protect your table. For variety, you can cut different coloured noodles, cut shapes out of the noodles (they will naturally be circular), or cut thicker and thinner slices. You'll end up with a set of blocks that make hardly any noise when knocked over, don't hurt to step on and are lightweight. This is a clever way to make a toy out of a pool noodle, but is noisy block playing really a problem?